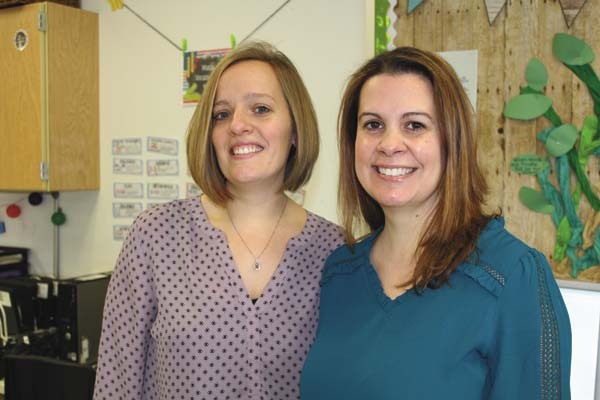 FONDA — Fonda-Fultonville Central School District elementary school teachers Tanya Chmura and Shelly Shaffer have achieved National Board Certification, which is considered the most respected professional certification available in K-12 education, according to a news release from the district. According to NYSUT, only 3 percent of the national teaching population has achieved this certification. It was designed to develop, retain and recognize accomplished teachers and to generate ongoing improvement in schools nationwide. Chmura and Shaffer are the fourth and fifth teachers at FFCS to earn the distinction. Chmura is a second-grade teacher and Shaffer is a special education teacher. They co-teach a class together. Both Chmura and Shaffer say that earning national board certification was the ultimate piece of professional development that made them better educators. “The experience changed my approach on how to more effectively design instruction around my students’ strengths, interests and needs,” Chmura said. Often considered the gold standard of achievement, national board certification requires teachers to demonstrate standards-based evidence of the positive effect they have on student learning. The certification created by teachers for teachers, represents a consensus among educators about what accomplished teachers should know and be able to do. Board certification is available in 25 certificate areas from prekindergarten through 12th grade. ∫ Take a computer-based, written test in their content area. ∫ Show examples of how they’ve tailored instruction to drive individual academic gains. ∫ Provide examples of ways they’ve used data and school and community resources to improve outcomes for their students. Chmura has worked as a second-grade teacher at FFCS for 17 years. She has been an educator for 20 years. She also taught kindergarten in Dallas, Texas. She has a master’s degree in elementary education from Russell Sage College and a bachelor’s degree from the State University at Brockport. Shaffer officially began her teaching career at FFCS in 2008, though she had served as a substitute teacher for several years prior. She has taught special education in various classrooms at the elementary school. Shaffer, an FFCS alumna, has a master’s degree in childhood education and special education from Touro College, a bachelor’s degree from SUNY Oneonta, and an associate’s degree from SUNY Cobleskill. Chmura and Shaffer join teachers Ann Mahon and Deidre Palmer with school nurse Nancy Ballerstein as national board-certified staff members at FFCS.